A Chinese manufacturer built agricultural garden on its factory roof for its employees. 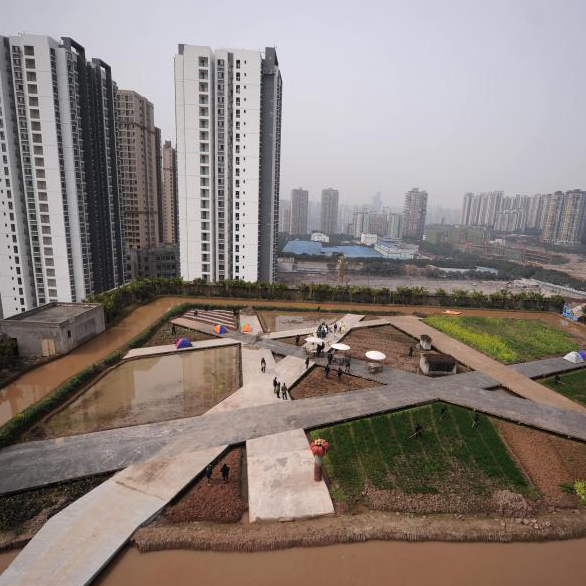 It is the first "community farm” built by a corporation named Meixin Group in Chongqing. The employees can plant vegetables in it and even keep poultry. The company is going to open the farm to the public freely which can involve the surrounding residents and enjoy the planting. We called the company, they said the soil was transported through a passage which is connecting the ground floor and the roof. The water is leading to the roof by pumping. A department has been set up to manage the farm. Those who want to do the farming should hand in an application form, the management department will assign an area for them. A competition system is used in the farm. Those who plant good stuff will survive and those who don't will have to hand the area to others. This roof farm can beautify the environment and activate the employees. Getting the employees' family or surrounding residents involved in the farming is also a good way of branding, showing that the company cares for people and life. The company called Meixin Group is building all kinds of doors.